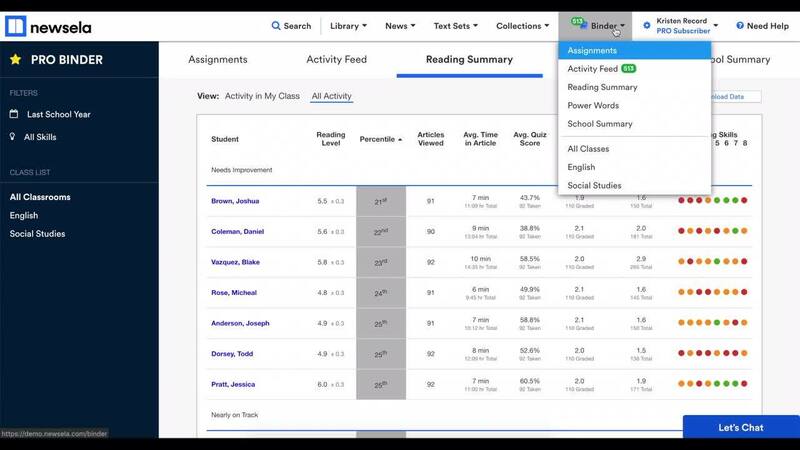 Teachers can review student work in the activity stream, article page, or Binder. Select an option below for an overview of reviewing work in each location. In the rest of this section, you can find information about reviewing all types of work that students can complete on Newsela. To see the activity stream, hover over Binder at the top of the page. In the drop-down, you will see a scrollable list of work recently completed by your students. Clicking an item in this list takes you to the article page, where you can review the work in more detail. On the left side, you will see a list of students who have completed work on the article. For assigned articles, you will also see a list of students who have not yet viewed the article. Under each student's name, you will see a row for each reading level at which they completed work. The Newsela icon indicates the student's current Newsela reading level. Click a row to review work. You will now see student annotations on the article. In the activities panel on the right, you will see quiz answers, writing responses, and Power Words activities. Note: Whether you have assigned an article or not, you can see student work in this way on the article page. Hover over Binder at the top of the page and click Assignments in the drop-down menu. You will see a list of your assignments. From here, you can review how many students have viewed the assignment. Click an assignment to go to the Assignments Review Page. From here, you can review a summary of class activity for the assignment. To see class activity in more detail, scroll down and click an article to navigate to the article page. Hover over Binder at the top of the page and click Reading Summary in the drop-down menu. Select Activity in My Class or All Activity. From here, you can review each student's reading level, percentile, articles viewed, activity averages, and reading skills insights. In a student's Reading Summary tab, scroll down and click a class name or Independent Reading to see a row for each article on which they have completed work. In an article row, click on an activity to review it in more detail on the article page. For a shortcut to resetting the quiz score or requesting a writing response revision, click the three dots on the right side. Hover over Binder at the top of the page and click Power Words in the drop-down menu. You will see a list of students and their Power Words averages and progress. Click a student's name to view more details about their Power Words activity.